You will want to wander down off the main road and find some interesting waters, colors, rocks and things to make your photography pop. Hiking boots that are waterproof is a good thing to think of getting before you go here. It’s somewhat marshy at this location when you go through the bushes down off the road. The Canadian Rockies mountain system comprises the southeastern part of this system, laying between the Interior Plains of Alberta and Northeastern British Columbia on the east to the Rocky Mountain Trench of BC on the west. The southern end borders Idaho and Montana of the USA. In geographic terms, the boundary is at the Canada/US border, but in geological terms, it might be considered to be at Maria’s Pass in northern Montana. The northern end is at the Liard River in northern British Columbia. The Canadian Rockies have numerous high peaks and ranges, such as Mount Robson (Sometimes called Mount Bella) (3,954 m (12,972 ft)) and Mount Columbia (3,747 m (12,293 ft)). The Canadian Rockies are composed of shale and limestone. Much of the range is protected by national and provincial parks, several of which collectively comprise a World Heritage Site. 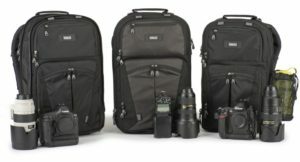 Photography Magazine Extra and Pam Goodyer only use Think Tank Photo Bags. Click for information. When to Go: We like to go when spring just springs before the crowds show up in the Canadian Rockies. Fall is a great time too. I would try to avoid peak time in the Canadian Rockies which starts about mid-June and goes through August. There are a lot of bus people, and they do not care if they walk right into your picture. Go before they are everywhere or after. Lens: This area is a wide angle lens location but you should have your zoom lens handy in case you see some wildlife. There are some birds at this location. Gear: To get started, bring your tripod and your circular polarizing filter. The CPL will make your puffy white clouds burst and deepen the blue sky color around them. It will also take the glare off the water and replace it with the reflection. 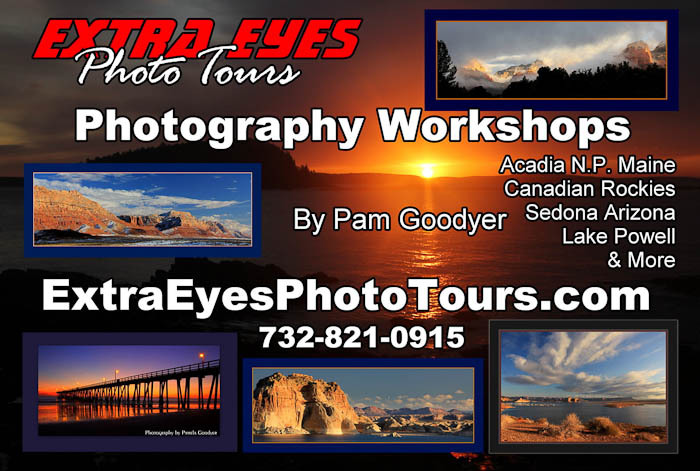 Bring your tripod too. If there is not enough light when you are shooting, you will want to use it to get the depth of field, (higher F-stop). Don’t forget your ND filter in case of you want to shoot moving waters. We found a small amount of running marsh waters here in June. Gear List at a Glance: Circular polarizing filter, neutral density filters, tripod, shutter release, wide angle and zoom lens. Aperture Priority – It is used to get your depth of field (control how much is in focus from your subject back). You will want to do some shots at the hyperfocal distance. If your shutter speed drops to 1/30th sec. or lower you will need to put your camera on a tripod. The higher the f-number the less light that will come in and your shutter speed will drop to let more light in. When doing certain shots such as flowers, you might want the opposite effect. That is when your subject is in complete focus, and the background is totally blurred called the bokeh effect. You will use your lowest F-number such as 2.8, or 3.5. Go as small as your particular lens will allow. Shutter Priority – If you have moving subjects such as the birds flying by you want to shoot in shutter priority to be sure they come out clear. When people are walking through shoot at 1/250th sec. and adjust your ISO accordingly. If people or animals are running, increase your shutter speed to about 1/500th sec. and if it’s a bright sunny day, go as high as 1/1000th to 1/1200 sec. to get the birds crystal clear as they fly by here. 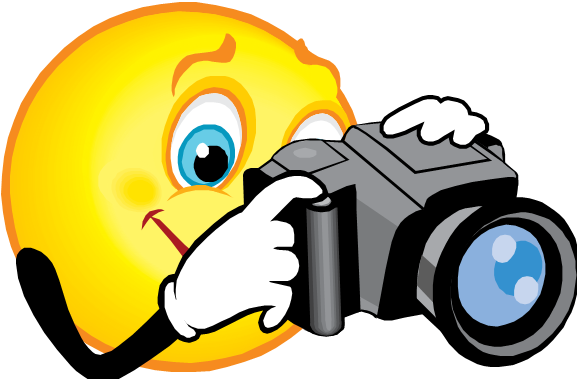 Manual Mode – To do your long exposure running, milky water shots you will have to use a tripod. All of your settings will vary depending on the lighting and what neutral density filter you have. You will shoot in manual mode for the milky waters. ISO is always 100 or as low as your camera will allow. Aperture is f22. Your shutter speed will vary depending on the light. Take some test shots to decide on your shutter speed after you put your neutral density filter on. (It’s like sunglasses for your camera to stop light from coming in). Use your live view mode to focus to lock the mirror up and avoid any camera movement. Use your shutter release or your 2-second timer to also prevent camera movement. Voila. You now have your milky water exposure. You want at least a 2-second exposure for running water. If you don’t have a neutral density filter, you may not get more than 1/15th of a second in the sun. Go to our store to buy your ND filter. I have a 3.0 for super long exposure in the sunshine. Right across the street from the entrance to Vermilion Lakes you will find our favorite hotel. It is not downtown like the others but out here in nature. 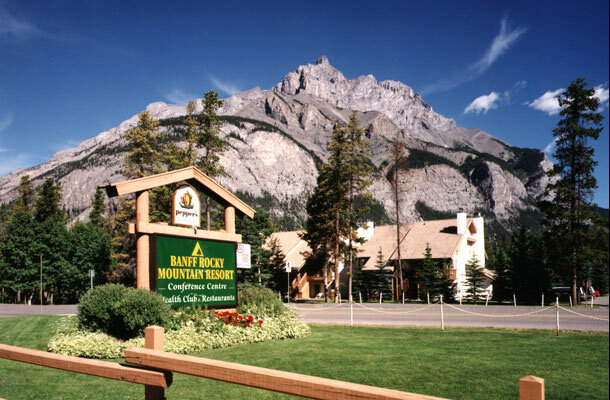 Our Favorite Canadian Rockies Resort – Banff Rocky Mountain Resort – 1029 Banff Avenue, Banff – (800) 563-8764 in Canada/USA | +1(403)762-5531 Local – The Banff Rocky Mountain Resort is the perfect rocky mountain getaway for any traveler. 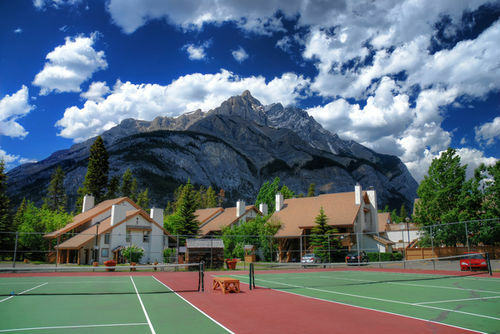 They feature suites and condo style accommodation in Banff National Park. Stay with them and enjoy the comforts of home and more. This picturesque location has a dining room, a deli, tennis courts, health facilities, swimming pool, squash courts, and conference facilities. Take your vacation at Banff and live the mountain lifestyle. 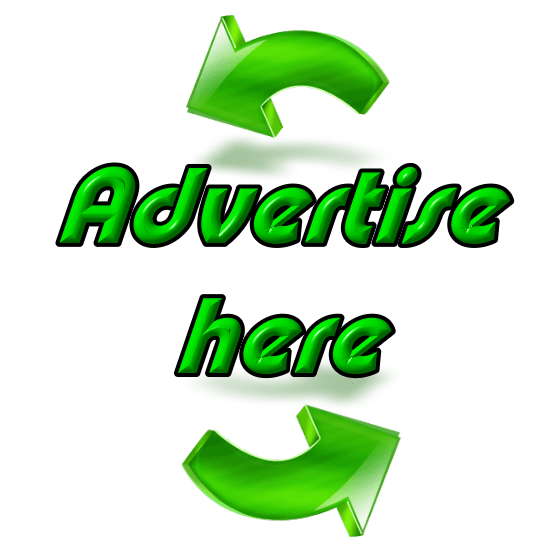 We need you to advertise here!! Located just minutes from the Village of Lake Louise, this year-round campground is perfect for anyone needing space for larger units and people wanting power without full hook-ups. It is close to local attractions and offers mountain views, year-round camping and access to hiking and biking trails. Evening interpretive programs are offered during the summer season. Sites: All 187 campsites have picnic tables and electrical hook-ups. Some sites have fireboxes. 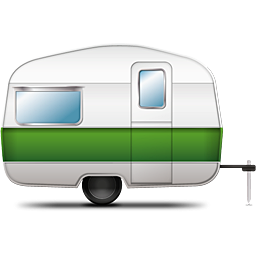 Electrical-only sites (15 and 30 AMPS) can accommodate RVs up to 15 meters (50 feet) in length. A maximum of 6 people and two vehicles are permitted on each site. All vehicles must be parked on the gravel area of the campsite. All soft-sided camping units must stay in the enclosed electric fence in the Lake Louise Tent Campground. If you would like your business to be featured in this section please email or call us. To view our advertising rates go here. 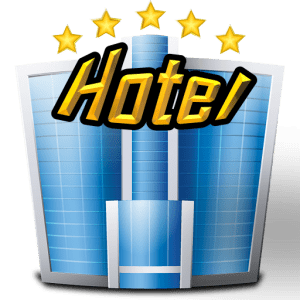 To have your hotel, restaurant, campground or business listed on this page on this page see our section below.